The Toronto exodus has begun. Eight days before the NHL’s trade deadline, the Maple Leafs shipped centre Shawn Matthias to Colorado in exchange for Avalanche prospect Colin Smith and a fourth-round pick in June’s draft. That leaves the Maple Leafs with 12 picks in the upcoming draft - and a little over a week to stockpile more. 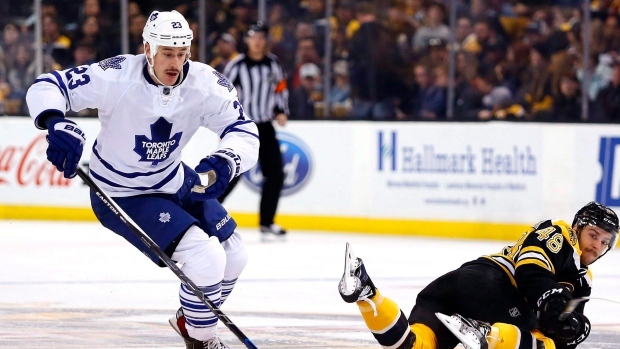 Matthias signed a one-year, $2.3 million contract in Toronto last summer, a cap-friendly deal many believe the Leafs inked for the express purpose of flipping Matthias before the deadline. In Smith, a 22-year-old centre, the Maple Leafs found a “C”-grade prospect who is known for his speed and a little edge to his game, even though he is just 5-foot-10. Smith made his NHL debut with the Avalanche last year. He was held off the scoresheet in six minutes of action and hasn’t been recalled this season. The former seventh-round pick (192nd overall in 2012) has 13 goals and 21 assists for 34 points in 54 games with the AHL’s San Antonio Rampage this year, third in team scoring. He was a 106-point scorer in his final year of major junior with the WHL’s Kamloops Blazers in 2012-13. Maple Leafs GM Lou Lamoriello said in a conference call Sunday that Smith is heading to the AHL’s Marlies. No team has more picks in June’s draft than the Maple Leafs, with Toronto (12) surpassing Buffalo (11) on Sunday. In addition to their own picks in Rounds 1-7, the Maple Leafs have Pittsburgh’s first-rounder (Phil Kessel), New Jersey’s third-round round pick (also from Pittsburgh), as well as sixth-round picks from Anaheim (Korbinian Holzer) and St. Louis (Olli Jokinen). Matthias was a key cog in Brendan Shanahan’s push to make Toronto a destination again for players, acquiring players proud to wear the Maple Leaf. The Mississauga-born Matthias was vocal about his happiness to join the Maple Leafs. “He’s going to be an asset for the role Colorado is asking him to play,” Lamoriello said. Matthias, who turned 28 on Friday, collected six goals and 11 assists for 17 points in the 51-game run with his hometown team. He scored against the Flyers on Saturday night in his final contest with the Leafs this season, his second goal in three games. Matthias is one of many Maple Leafs expected to be on the move before Feb. 29, including P.A. Parenteau, Roman Polak, Michael Grabner and Nick Spaling. Only eight players on Toronto’s current 21-man roster are under contract for next season. Lamoriello hinted that he would like to try and strike early, before the deadline, in as many deals as possible. “The talks have increased,” Lamoriello said. “To what extent, I can’t answer because I’m on the different side of the fence” as a seller.